Keith was born and raised in Springfield, Ohio. As a middle child among five, he shared his home with one brother and three sisters. He was raised in a Christian home and three of the five children are serving in full-time ministry. His older brother is a pastor in Colorado Springs, CO, and a younger sister and her husband pastor in Hubbard, Ohio. 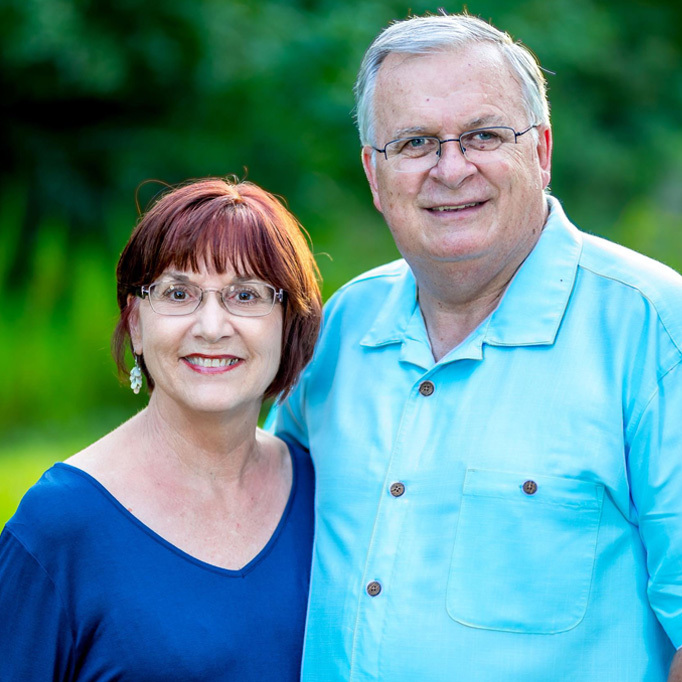 Ken and his wife Rita are on their second stint at Crossings, having attended from late 2002 - 2013. Ken has worked for Charisma Media, a Christian publishing company in Lake Mary since 1999, and currently serves as Controller. He is also currently working on a Masters In Theological Studies at Southwestern Baptist Theological Seminary. Their daughter Emily and her husband live outside of Dallas and their son Robb and his wife live in Jacksonville. Pastor Aaron was born and raised in Titusville, FL. He has been serving in full-time worship ministry for 20 years. His greatest passion is that people will see and understand that worship is not just a Sunday-morning thing, but a lifestyle of pursuing Jesus. He is married to his best friend Katie and together they have 2 incredible God-loving kids. Pastor Aaron enjoys spending time with his family, whether it at the beach or seeing a movie. He loves to read, play tennis and listening to music. Jonah and Julie have been attending Crossings since 2010. They have served within student ministries for most of that time. Jonah was born in Indiana but grew up in Florida. Jonah grew up going to church but it was through his youth pastor at the age of 15 where Jonah truly chose to fully submit to following Jesus. After starting a family and working in the Corporate Finance for almost 20 years, Jonah is listening to God's calling to lead students to an eternal relationship with Jesus! Julie, an Ocala, Florida native and daughter of a preacher has grown up in the church serving the Lord most of her life. Jonah and Julie have 4 children, Kylie, Wyatt, Emma and Noah ranging from 17 years old to 3 years old who are the joy's of their life! I have been attending Crossings Community Church since 1998 and I have been blessed to work for Crossings since 2003. Growing up as a Pastor's daughter, church has always been a huge part of my life. The importance of serving and being connected in a local church body was planted in me at a very young age. Therefore, I have been serving in church ministries since I was old enough to participate. You name it, I've served in it! Aside from serving in various ministries at Crossings, I'm grateful to have the opportunity to use my gifts to benefit this awesome church! My family and I came to Crossings in 2005. When I first came to Crossings I served as a volunteer for a number of years in children and youth ministries before joining the ministry staff. In July, 2010 I organized the first Crossings mission trip to Honduras for a team of 30 people. It was the beginning of an exciting and life-changing foreign mission program for both the church and all of those involved. My husband and I, with our two children have called Crossings Community Church our home church since late 2007. I grew up in Miami Lakes, Florida and then graduated with a Bachelor’s in Fine Arts degree from the Kansas City Art Institute in Missouri in 1998. I have grown up in ministry as my father was a Pastor for the United Church of Christ for many, many years until he retired. I am fortunate to have my mom and dad attend Crossings with me and my family. I have attended Crossings since 1994 and have served as church treasurer for most of those years. I also serve on Crossings Board of Directors and am a member of the Women’s Ministry team. I grew up in rural Ohio in a wonderful, loving family. My parents taught me to love Jesus and stressed the importance of working hard and living a life of integrity. I feel as if I won the lottery to have been given such a wonderful head start in life. I have two young adult children who were blessed to grow up in Crossings. My husband Frank is the saxophone player on the worship team; he has a lot of fans, but I am his biggest! I hold a Bachelor’s Degree in Accounting and am a non-practicing CPA. I owned an IT-staffing business for 27 years and witnessed God’s faithfulness over and over again as I learned to allow Him to be my CEO, CFO and COO. It is an honor for me to serve as Crossings’ treasurer. I consider it of highest importance to maintain the integrity and confidentiality of our church’s finances and am very thankful that God has placed me in a position of service where I am able to use the talents He has given me.